Fall is just around the corner and you know what that means … pumpkin spiced everything! Ahhhhhhhhh!!!!!!! Ok, yes. But also: Nature! Yes, there are things to do in the fall other than stand in line for coffee and wear scarves. We’re talking leaf peeping, people. This can mean a major adventure (ok, not that major, it’s still foliage) or a serene meditation, depending on your vibes. No matter what your autumn appreciation style is, we’ve rounded up the best spots in the country for watching the seasons turn, turn, turn. So go on and get your dying leaf love on. Vermont is a source of natural beauty year-round but during its peak season (the first week of October) it’s crazy gorgeous. The Green Mountain Byway, nestled between Waterbury and Stowe, offers plenty of sights to see and outdoor activities to enjoy. And though the ski slopes are mostly closed in early fall, some resorts open their lifts, so you can experience the colorful views from way up high. 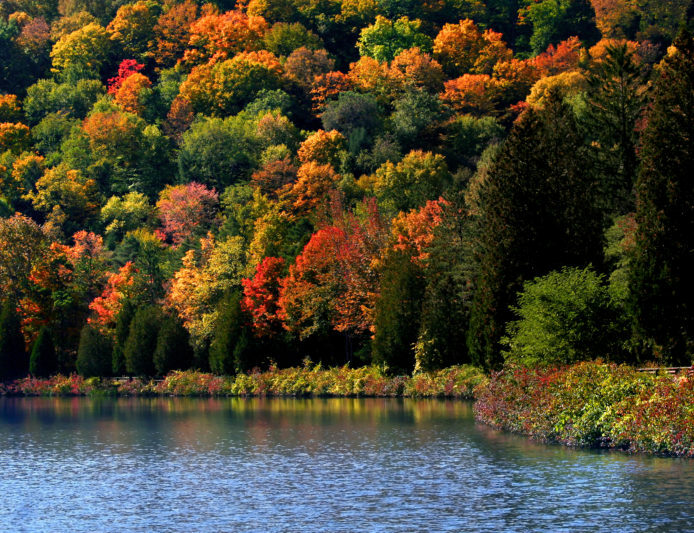 Bordering three of the great lakes, Michigan’s Upper Peninsula (or The UP to those in the know) has unbeatable views of the bursting fall colors. The carved-out canyons and blue waters only enhance the experience, so it’s worth taking a boat or paddle tour of the magnificent scenery. Just be sure to go before mid-October—winter hits early up in these parts. Montana’s Glacier National Park is a sight any tie of year, but the autumn foliage takes this scene up a notch. And since fall is one of the quieter times at the park, it’s a great time to explore the scenic byways. Don’t be surprised if you run into some amazing wildlife—including bison, elk and wild birds—along the way. Beginning in late September, the lush green mountains of New Hampshire are painted in various shades of gold, red and violet, drawing thousands of visitors each year to the picturesque landscape. Here, peepers aren’t limited to taking in the beauty by car or foot. Take the train, rent a bike or (if you’re really into this stuff) ride a horse. The Blue Ridge Parkway is a sight best seen from your car window. Ride along U.S. Highway 441 to view the Blue Ridge between Cherokee, NC and Gatlinburg, TN. There are plenty of scenic overlooks to stretch your legs, smell the fresh mountain air and take in the views (and some photos!) from 5,049 FT up. And, if you want to make a whole road trip out of it, there are plenty of campsites to stop at along the way. What are your thoughts? Know of some beautiful places in the fall? Comment below and let us know!! !